Remember the Holiday Magic Christmas card from last week? If not you can view it here. I recently had someone order a christmas card kit to give as a gift and thought what a nice idea that was. So today, I'm working on making one for my mom. We used to do craft together all the time when I was in high school, so I thought it would be nice to still have this connection with her and how wonderful it is to get a handmade card from someone, right? If you would like to order your own Christmas Card Kit, please contact me. Card kits are $15 for 10 cards or $20 for 20 cards. 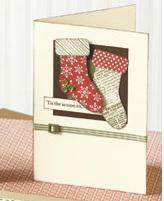 All card kits include envelopes and pre-cut card stock and embellishments. You will need your own adhesive and scissors. Stay tuned, as tomorrow I've got a tutorial ready for you.